House #2, the Charmer, sold. After 5 days on the market. To someone else. The same night I posted about it. Dramatic sad mopey face. Even though the Charmer isn’t even an option anymore, can I just say how much I loved and appreciated all your advice? There were a few comments that seriously honestly for real might have swayed our house-buying decision one way or the other, and I mean literally just A COMMENT, from you sweet readers, across the internet world somewhere, which is just weird and amazing. You all are a very house savvy bunch, so thanks a mil for taking the time to leave your two cents about which house we should buy. The funny thing about this is that now that the Charmer has sold, we don’t feel any special pull towards buying the Happy Easy home. I guess it just wasn’t meant to be with that old cutie and maybe it’s a good sign that we should keep looking. I’ll keep you posted, you house lovers you! And when we DO find a house, hey! I know what to make for our We Finally Found a House celebration. It starts with Cinnamon Sugar and ends with Zucchini Coffee Cake. So do you remember my jumbo ZUCCHINI? All caps for size representation. Here’s how I’ve used it, by fifths. 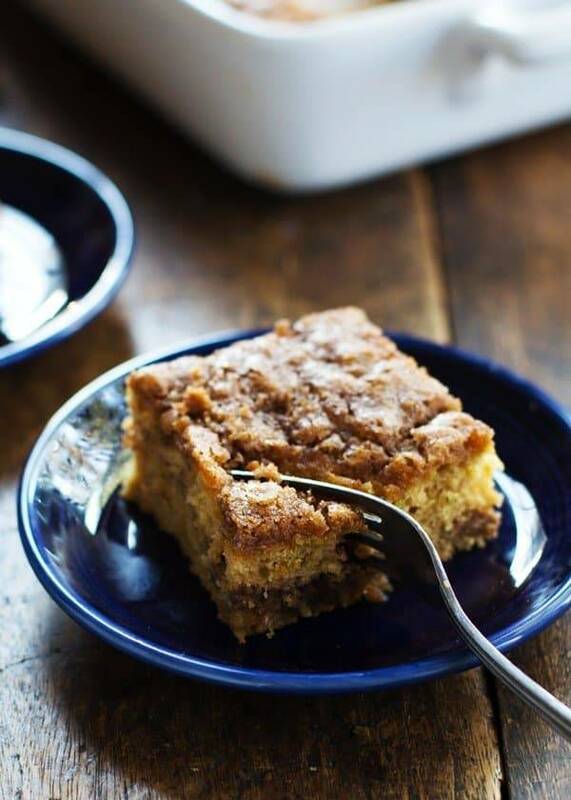 I made this Cinnamon Sugar Zucchini Coffee Cake twice – get it? 2/5? – and the first time I didn’t make it with the middle layer of cinnamon sugar. Like, it didn’t exist in my brain yet. But then the second time I got this food vision for an extra cinnamon sugar layer through the middle because I like things that are have sticky sugary middle layers, yeah? Go look at one of the pictures and see if you can spot that little layer in there. It’s subtle, like the kind of thing where you might not notice it at first bite and then BOOM! You get a forkful that has that sweet layer running through it and your world is rocked. 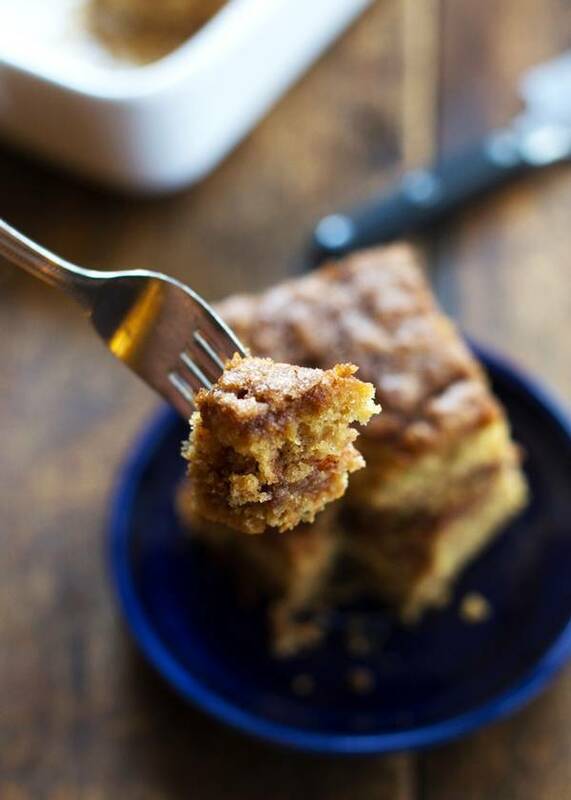 If you don’t like sticky cinnamon sugar middle layers in your zucchini coffee cake, you’re allowed to leave it out. Buuut that does make you a weirdo. PS. Possibly even more than middle layers, I like LOVE cinnamon sugar top layers. For the heavenly top crust on this zucchini coffee cake, the butter and sugar and cinnamon get crumb-ed, spread over the top, and baked into some kind of wonderful cinnamon sugar crunchyyy. There you are going about your business, and all of a sudden you find yourself eating this thin crunchy cinnamon sugar layer on a cake that sort of melts in your mouth and that just so happens to have VEGGIEZ in it, and I bet you’re having a lot of fun. This is one of those cakes that you can eat for breakfast, morning snack time, after school snack time, bedtime snack time, dessert, and come to think of it, anytime in your whole life. 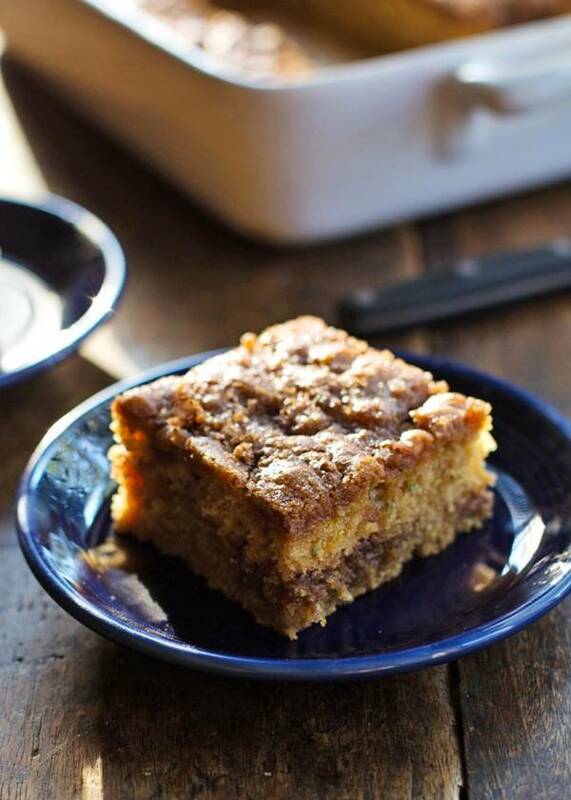 This Cinnamon Sugar Zucchini Coffee Cake is so simple! It takes about 10 minutes to make and has two layers of cinnamon sugar. Mmm. Press or drain the excess moisture out of the zucchini shreds. Mix the cake ingredients in order given. Combine the topping ingredients with your fingers or in a food processor to make a crumbly topping. Pour half of the batter into a greased 9×13 cake pan. Cover with half of the crumbs. Repeat with the remaining batter and topping. Bake for 45 minutes. The top will be crunchy and textured and the cake will bounce back when you gently press it. And then it will be gone fast. Happy Labor Day to all the laborers! Now go make a cake. I can’t wait to try this! Zucchini is my really big success of gardening this summer (because it’s really easy to grow). Major bummer about the house…. it’s crazy because it sounds like when it comes to buying houses in the area, you have to be ready to make an offer right away. Since this charmer didn’t work, maybe it’s helping you realize that’s what you want and you’ll be ready to make an offer on even a more charming charmer next time!!! I started baking with zucchini a few months ago and I love it! It gives a nice moist texture to whatever cake you want to bake. PS: love the backlight in your pics! 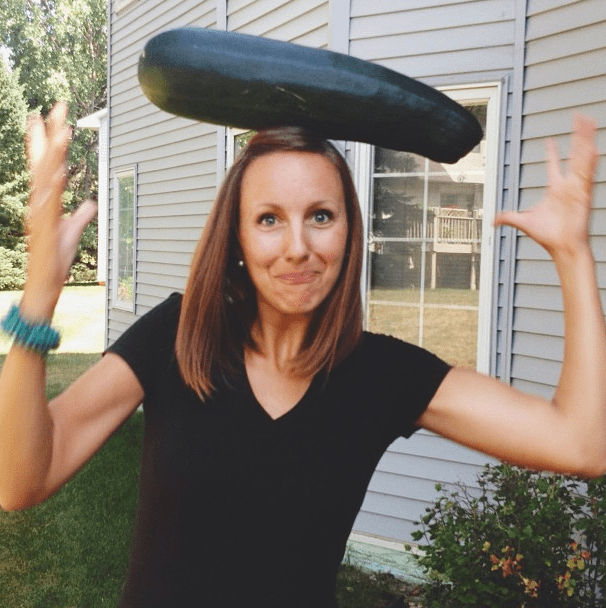 I have yet to bake with zucchini – so loving all these recipes! Cake looks gorgeous! Yes, it just wasn’t meant to be – happy house hunting! Thank you! Such good advice! Sometimes I despise those large zucchinis. They were supposed to be picked a few days ago. But it happens and then you’re left trying to figure out what to do with it. I can’t wait to try this recipe! I’ve never tried it in a coffee cake yet. Thanks! Hm, I am 99% sure that I did add salt both times I made it, but since I was working off of an old recipe I must have forgotten to add it to this new version. I’ll change that. 🙂 Thanks for the comment! Do you think this would freeze well? I would like to make it for a brunch I have coming up and I want to try and get as much done ahead of time as possible. Cinnamon sugar toppings are my favorite part of any coffee cake!! My family picked our favorite brunch restaurant based solely on their coffee cake: blueberry with a thick crumb topping. They offer a second flavor too that changes with the seasons; maybe I can convince them to try your zucchini one next summer! So I was a little late in reading (and commenting) on your house post…oops! Sorry it was snatched up, but now that you know what you love it’ll make it even more fun to keep looking! Good luck! Thanks Stephanie! Glad you liked it! Made this and it turned out great. I just finish bake this , my house smell like heaven and it taste even better , thanks for sharing this wonderfull dish ! , i use plain natural yogurt instead of buttermilk and more sugar ( only because yolo ) , thanks from the bottom of my heart. hhahaha yes Camila I love you. So glad! I love comments like this. Thanks Ellysa! Made it. Love it. You are genius! Thanks for the comment – I’m so glad to hear that Lisa! I’m so glad! Thanks for the comment Lisa! Absolutely amazing!! Thank you for the recipe. I made it gluten free so I can actually enjoy it, and I cannot stop eating it! Yum! I love hearing that! Thanks for the comment Katie! 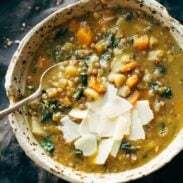 this looks amazing – im really to keen to give it a go, but am struggling to see where the coffee is listed in your receipe, there doesnt seem to be any! I made this a couple nights ago and it was the BOMB — especially the crunchy cinnamon topping. Now I need you to make me this recipe for pumpkin coffee cake. Incredible recipe! I’ve slso made it with unsweetened applesayce instead of oil & substituting half the brown augar with Truvia brown sugar blend. That way I can enjoy the crumb topping guilt free. Ok – Lindsay – I’m feeding 20 ministers of different faiths in the morning. I have a blueberry coffee cake in the oven, ham ready to slice, some strata’s to get together and I am looking for something to feed them that will also get rid of one of my 4 huge zukers. I am going to take a chance on you and yours. I hope it is as good as your say! Other than the zest, I followed this exactly. When pouring the remaining batter on top of the first crumb layer it sank right into the previous layers. There was no separating them. It seems like the middle crumb goodness floated right to the top with the rest resulting in no middle layer at all. It’s not a bad cake. It is SUPER sweet.